A Musical Experience FOR LIFE! 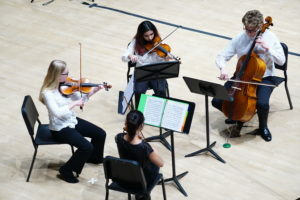 The OPUS camp faculty places students in chamber music, based on submitted audition videos, in small ensembles of two to six players which develops teamwork and draws on the individual strengths of each young musician. Chamber music requires close attention and therefore OPUS has 30 faculty members, which gives a high teacher to students ratio (1 teacher every 3 campers). They are assisted by 20+ teaching assistants and instructors. The program is not just chamber music and orchestra or handbells, it is a compact mix of many joyful classes, loved by many enthusiastic young artists year after year (up to coming 14 times). Camaraderie, character-building, teamwork, cultural appreciation, music and people skills are just some of the major benefits campers take away with after attending the OPUS camp. New friendships are born and old friendships are rekindled. Camp applications are due by June 12, 2018. Scholarship applications are due no later than June 5, 2018. Admission is based on electronic auditions. Groupings and music assignments will be decided in early-July, and music will be made available to campers for practice ~3 weeks prior to the Camp. 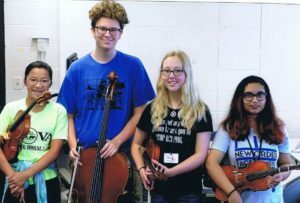 The 16th Annual 2018 OPUS Chamber Music Camp Open for Enrollment My Musical World: the Perspective of Camper/Teaching Assistant Brandon J.